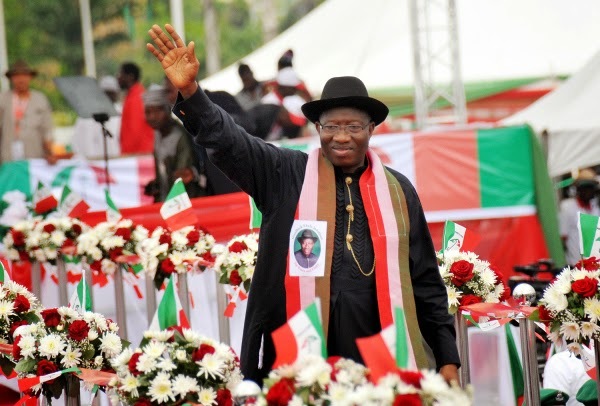 The presidency wants Nigerians to re-elect President Goodluck Jonathan, and they have given 12 reasons why you should. According to Punch, the reasons were listed in an article titled, Twelve reasons to support Jonathan, published in the current edition of the in-house magazine of the State House, Abuja, called Villascope. - Advances in road construction: The report states that “Jonathan met 4,500km of motorable roads but constructed/rehabilitated 25,000 km of roads.” This helped drastically reduce travel time nationwide. - Improved educational infrastructure: Jonathan built 125 Almajiri schools, 14 universities and special schools for girls in 27 states. He gave 101 scholarships to first-class graduates to pursue postgraduate courses in the best 25 universities in the world. He sponsored 7,000 lecturers of federal and state universities and polytechnics for postgraduate studies to improve quality teaching. - Railway rehabilitation: Five million Nigerians now travel by train after the present administration rehabilitated the nation’s railway. - Increased access to housing: 1,000 housing units have been built in the six geo-political zones of the country. Prince Harry and Emma Watson Dating?